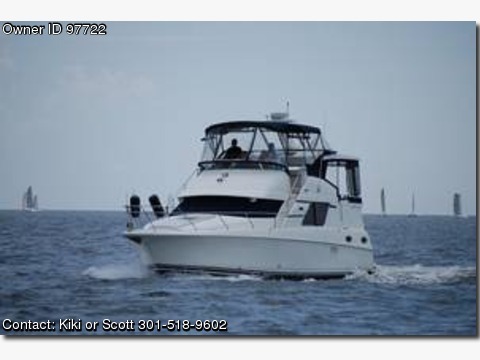 Please contact boat owners Kiki and Scott at 301-518-9602 or kikiwilki48@aol.com . 2001 392 Silverton Motoryacht w/upgraded 370 Hp Cummings Diesel Turbo engines Max power super efficient when originally built engines were 60,000 upgrade. Our boat has been meticulously maintained and is in great condition with many audio video upgrades. New Intellian Satellite TV system, 4 Flat screens, HD Home theater system, 3 zone Fusion sound system, new carpets, new aft deck furniture, new fwd AC/Heating system, Force 10 oven w/3 burner electric stove, new electronic fireplace, wine cooler, all Raymarine electronic GPS Color Chartplotter, Radar, VHF, Depth finder, Tri-data, Glendenning Engine Synchronizer, windlass anchor, Coast Guard pack, dockside power, full canvas, Halon, hard top, radar arch, storage, 4 deep cycle batteries, 2 Staterooms, 2 bathrooms w/separate showers, 8Kw Kohler Generator, flex steel sleeper sofa, sleeps 7 people. documented, prof. maintained, if military possible slip available. Note Same model boats for sale on Boattrader as high as 149,000 w/gas engines. Please do not respond to this Ad unless you have a serious inquiry.